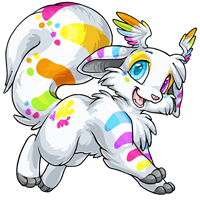 Myfi the Spectrum Kerubi has won the Pet Spotlight! congrats :) that´s a lovely pet and a quite personal story, thanks for sharing. OMG LOVE LOVE LOVE everything about this beautiful pet!! That TC is delightful, and thank you for sharing such personal details in Myfi's story. What a wonderful pet to win! <3 Congrats, Yuzu! As someone on the ace spectrum, thank you for sharing your story!